Ten years ago teenager Cissy Cahill witnessed a blood chilling horror in her elegant old San Francisco home. Now, in the sequel to IF SHE ONLY KNEW, Cissy's grown up, married, with a baby of her own, the nightmare nearly forgotten. 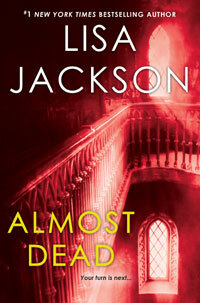 Until her happiness is shattered, the terror returning in a new Lisa Jackson thriller . . .
A WOMAN WHO WANTS TO GET EVEN . . . The first victim is pushed to her death. The second suffers a fatal overdose. The third takes a bullet to the heart. Three down, more to go. They're people who deserve to die. People who are in the way. And when she's finished, there will be no one left . . .
WILL DO WHATEVER IT TAKES FOR REVENGE . . .
Cissy Cahill's world is unraveling fast. One by one, members of her family are dying. Cissy's certain she's being watched. Or is she losing her mind? Lately she's heard footsteps when there's on one around, smelled a woman's perfume and noticed small, personal items missing from her house. Cissy's right to be afraid--but not for the reason she things. The truth is much more terrifying . . . INCLUDING MURDER . . .
Hidden in the shadows of the Cahill family's twisted past is a shocking secret--a secret that will only be satisfied by blood. And Cissy must uncover the deadly truth before it's too late, because fear is coming home . . . with a vengeance.